Say a�?Chumbaka�� and images of quirky magnets, luggage tags, laptop and phone cases and other cheeky accessories come to mind. 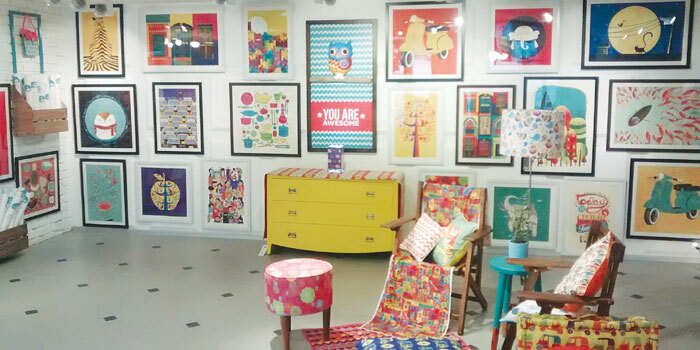 But the duo behind the label, Shubhra Chadda and Vivek Prabhakar, have taken their brand of quirkiness to a whole new level with their first flagship store on CMH Road, Bangalore. The move comes after they expanded their line to include a host of home and decor essentials like couches, stools, cupboards, crockery, cushions, lamps, carpets, quilts and framed prints. You are welcomed by a trademark chandelier extending from the ceiling of the first floor all the way down to the ground floor. Fashioned out of signature Chumbak tin cans, the outrageous funkiness of the lamp is echoed in an equally outre ceiling fan a�� the blades are covered with quirky phone cover prints depicting owls, mustaches, elephants, lotus and cows. a�?We wanted to reveal a whole new design language, which is what we call Chumbak 2.0. While we wanted to play around with the design language itself, we wanted to stick close to the original Chumbak. The new range is a culmination of all that,a�? say the couple, revealing the launch of nation-wide stores soon, including in Chennai.